Photo provided by Marcel Staron. Alejandro de Humboldt National Park covers a range of ecosystems unparalleled in the insular Caribbean. The karst landscape is crossected by many rivers. The park has a high biodiversity, with high numbers of endemic flora, and vertebrates and invertebrates. 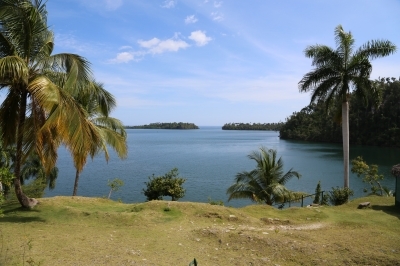 The park lies in the eastern Cuban provinces of Holguín and Guantánamo. It was named after the German scientist Alexander von Humboldt who visited the island in 1800 and 1801. Visited this site in May 2018. There was still very dirty road from Baracoa, which took us over 1 hour to cover 30 km. Parque Nacional Alejandro de Humboldt, covering 707 square km, is famous for its richest fauna in the Caribbean with many endemic wildlife species. 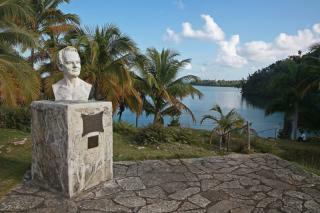 The visitor center is located directly on the main road, with some basic information, bust of Humboldt and excellent view over the moon-shaped lagoon. There are 1,200 different species of animals and 1,000 species of plants in the park, 70-80% of them are endemic. At the time of research, there were three available guided trails, except longest 3.5-day trail and Bahia de Taco trail due to the absence of boats to cross the river. We paid 10 CUCs for two of us and decided to do a boat trip around lagoon with the guide Junior. The boat was completely hand pulled by Junior, as they do not use engines in order to minimize damage to the park. We did a circle around lagoon, visiting mangrove forest, a number of hummingbird nests and enjoying beautiful views back to the shores. This was a very pleasant boat trip followed by a lunch in the family suggested by the guide. The further 20-km stretch of the road to Moa is still dirt and improves around dirt nickel plant only. Visited in January 2013. The last part of our journey through Cuba was the historically first town on the island, Baracoa. It's the base from which you can easily get to the Alejandro de Humboldt National Park. There are plenty of options on how to visit this site, we chose to take part in a guided tour that included 4 hour long trek around the National park. The price was reasonable, the guide waits you in city centre with bus at hand. The only downside of the tour is getting there, as the road is very rickety indeed, you will have to endure an hour and half of being shaken to your core. Once you get there, though, it's a different story: tropical flora everywhere around you, many trees and loads of greens that make even the heat of the day much more bearable. There are many curious examples of local fauna, such as tiny frog Iberica, wild hogs with their young piglets and large millipedes. Our guide was very entertaining and made sure we saw most of what could have been seen. The hike is an easy one, apart from first ascend you won't get much elevation. There's a gorgeous lake with a waterfall at the end of the hike, you get to enjoy a soak. Sensible shoes are a neccessity as the red clay on some parts of the trail gets extremely slippery and wet and some shallow river crossings are required. 31 Community Members have visited.